What is the Battle for the Quality of Made in Italy? How can olives grow their business? What are the markets of the future? 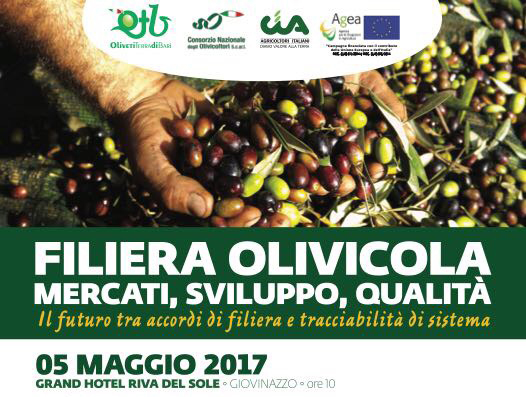 These are some of the most important themes of the round table organized by Oliveti Terra di Bari, Consorzio Nazionale Olivicoltori and the Italian Farmers Confederation, “Olivicola Filiera: markets, development and quality”, scheduled on Friday May 5th, at 10pm at Giovinazzo at the Grand Hotel Riva del Sole. Moderated by the director of TgNorba24, Enzo Magistà, the protagonists of the Italian olive branch, from producers’ representatives to industry, from market makers to national and regional policy makers will find themselves confronted with the most important issues for development and promotion olive. After a brief presentation of the projects carried out in recent years by Oliveti Terra di Bari and the Consortium Nazionale Olivicoltori with Gaetano Bonasia, technical director OTB, and Pierpaolo Iannone, Technical Manager Cno, will be interviewed by Gennaro Sicolo, President Oliveti Terra of Bari, David Granieri, Olivier Olearia Italiana Branch, Giovanni Zucchi, Oleificio Zucchi Spa Director, Giuseppe Gesmundo, Regional Secretary General Cgil Puglia, Benedetto Fracchiolla, President Finoliva Global Service Spa, Dario Stefano, Senator of the Republic, Leonardo Di Gioia, Councilor for Agriculture Apulia Region, Dino Scanavino, National Chairman of the Confederation of Italian Farmers.